Terry Taylor. STOP LAUGHING! Taylor had great runs in Mid-South Wrestling and the National Wrestling Alliance. By the late 80s he went to the World Wrestling Federation, and was given the worst gimmick ever, The Red Rooster. Some say Taylor never understood the gimmick, but does it really matter? The name alone was terrible. NO, not Terry Taylor silly! The Red Rooster! So, I'm gonna fix it! Terry Taylor never enters the hen house! 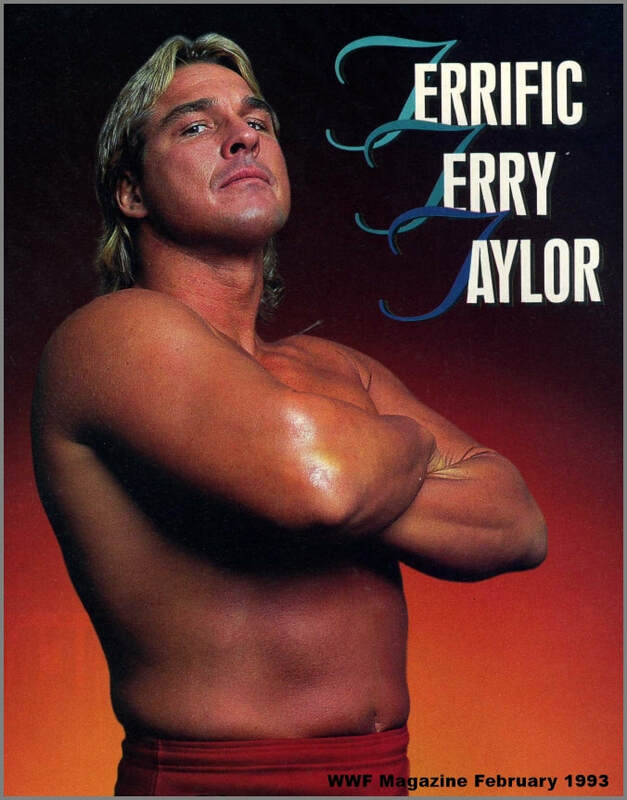 In fact, Terry Taylor, is down right TERRIFIC! Shortly after the 1988 ROYAL RUMBLE ppv, vignettes aired for the soon to be debuting Terry Taylor. For six weeks the vignettes aired, and on the seventh week Terry Taylor debuted on Wrestling Challenge. Terry Taylor beats Steve Lombardi. "I've won a lot of matches, won a few titles, but none of that matters now. Now, I'm in the big leagues. This is where legends are made and legends become Icons. Well, I'm not just a legend, not just an icon, I am, without a shadow of a doubt, TERRIFIC." Terry Taylor beat Koko B. Ware. "Gene, anybody who knows me, knows I'm terrific in this ring. Those who don't know me, they'll soon realize how terrific I am. In fact, just call me, Mr. Terrific!" The Next week on Superstars Of Wrestling, Mr. Terrific comes out in new ring attire, and robe, that say Mr. Terrific on the back. He has a match and cuts an interview, but gets a surprise! Mr. Terrific Beats Kevin Dunn. And out comes Tito Santana! "Mr. Terrific? Are you kidding me? Who have you beat? You want to be terrific? Fight me!" Mr. Terrific exits the ring. The next week on Superstars, after Santana wins his match, he gets attacked by Mr. Terrific! The Match has been made official, Tito Santana vs. Mr. Terrific, at...WrestleMania 4! Mr. Terrific beats Tito Santana. Tito Santana beats Mr. Terrific by disqualification. Mr. Terrific beats Tito Santana with Terrific's feet on the ropes for added leverage. Then there was a tag match on Wrestling Challenge. Mr. Terrific and Big Bossman beat Tito Santana and Koko B. Ware after Koko turns on Santana. The match was taped to air after Wrestlemania to set up Santana's next feud! The night before Wrestlemania at a house show, Mr. Terrific beats Rick Martel after Santana accidentally hits Martel with a flying forearm! Tito Santana beats Mr. Terrific. At a Superstars taping, in a match that never aired, Tito Santana beats Mr. Terrific by count-out. The match never airs as the company decided to go with the Koko B. Ware versus Santana feud a little sooner then expected. Santana gets Ware, Mr. Terrific gets The Ultimate Warrior! Honky Tonk Man gets injured and the Intercontinental title needs a new holder, so a tournament is held. It comes down to Mr. Terrific versus Brutus Beefcake! Mr. Terrific beats Brutus Beefcake to become the NEW Intercontinental champion! Well, Mr. Terrific, was gonna lose the title to Beefcake at SummerSlam, however, Beefcake got injured, and a makeshift opponent, who otherwise was not on the card, was chosen! The Ultimate Warrior destroys Mr. Terrific in 34 seconds to win the title! doesn't come back alone. He hired himself a manager, Bobby The Brain Heenan! Then, Mr. Terrific would last forty minutes in the Rumble Match! Terrific wants The Ultimate Warrior, but Warrior is busy with Rick Rude. Terrific is growing impatient as Heenan promised him the Intercontinental champion! To settle it, Rude suggests a one on one match between himself and Terrific, the winner gets Warrior. So on Superstars, that's what happens! Rick Rude pins Mr. Terrific after Heenan turns on Terrific! Getting closer to Wrestlemania 5, Mr. Terrific wants revenge, but first he makes an announcement! "My name is TERRY TAYLOR! The Heenan Family...THEY"RE DEAD! Every last one of em!" Wrestlemania 5 is a day away, and Taylor has beaten every member, except, Rick Rude! But, Rude is challenging The Ultimate Warrior! The Ultimate Warrior beat Rick Rude after Taylor costs Rude the match! Terry Taylor gets one shot at Rick Rude. On Superstars, the 2 men squared off! Rick Rude Vs. Terry Taylor ends in a double count-out! Taylor re-aggravates his back. He would have been able to return in August but his agreement ran out, and the WWF didn't re-sign him. Terry Taylor went on to return to the WWF in 1993, and had several short-lived stints, but he was mainly retired by the mid-90s. He currently works alongside Triple H in NXT, in one of the master classes for advanced students. Well, I hope y'all enjoyed this! Until next time, save me a ringside seat!